Tail coverage malpractice insurance provides the ability for an insured to report claims to their insurance company after a claims made policy ends. With a claims made policy, coverage for any new claims for professional services rendered during the policy period ends upon cancellation. Therefore, in order be able to submit claims to the insurance company, there would need to be an “extended reporting period”, also known as tail coverage malpractice insurance. Upon policy cancellation, the insured will have the option to purchase this tail. If obtained, the company will add it as an endorsement to the current policy. For example, Doctor Jones purchases a claims made policy that is effective from January 1, 2015 to January 1, 2016. At the end of this policy period, he decides to cancel the policy but does not obtain tail coverage. The doctor does not retire nor does he join a physician group that offers claims made coverage. On July 6, 2016, he receives a notice of a claim for professional services rendered on April 5, 2015. Because Doctor Jones did not obtain tail coverage malpractice insurance, there is no coverage available for this claim because the claim was filed after the policy canceled. However, if he had purchased tail coverage, Doctor Jones would be able to submit the claim to his previous insurance company for consideration. Tail coverage malpractice insurance applies only for professional services rendered from the retroactive date of the policy to the cancellation date and not for any acts that occur beyond that time, including the tail period. The retroactive date refers to the first day of an insured’s claims-made coverage. What is Free Tail Coverage Malpractice Insurance? Have been insured with the insurance company for a certain period of time, usually five years. Be at or above a certain age requirement; usually retiring at age 55 or older. Some insurance companies will provide a tail discount upon retirement without being insured with the company for five years. For example, if Doctor Smith has been with XYZ Company for only three years and retires, XYZ Company will provide a 20%discount toward the tail cost since he has not met the free tail requirement. What are the Costs for Tail Coverage Malpractice Insurance? 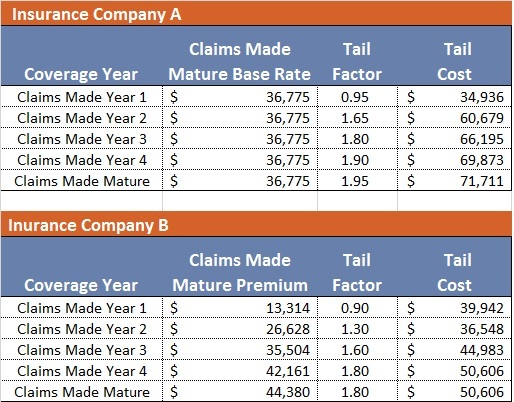 With Insurance Company A, the company calculates the tail cost using the Base Rate. The base rate is the starting point from which the underwriter calculates the final premium. The final premium can include premium credits, such as claims-free credit and part-time credits. In this case, the tail cost is calculated using a factor of the base rate. For example, if Doctor Steel cancels his coverage during his third year of claims made coverage, the cost for his tail would be $66,195. With Insurance Company B, the company calculates the tail using the final premium amount, using the base rate plus or minus any surcharges and discounts. If Doctor Steel needed to purchase a tail in year three with Insurance Company B, the tail cost would be $44,983. Are you obtaining new claims made coverage, but are retiring soon? If so, we recommend checking future tail costs between available insurance companies. In addition, you may want to consider a convertible policy, which provides a pre-paid tail. Do I have to purchase a tail from my current insurance company? No. Tail malpractice insurance coverage costs may be extravagant, sometimes up to 200% of your premium. In addition, a tail may be offered for only a limited time period which may not suit your needs. If you are not satisfied with your insurance company’s tail offer, you may opt to purchase tail coverage malpractice insurance from another company. This coverage is known as a Stand-Alone Tail. A Stand-Alone Tail provides the “extended reporting period” coverage that allows you to file claims for professional services rendered while you had the claims made policy. The cost, length of time for you to report claims, and discounts vary between insurance companies. The premium is 100% fully earned, meaning payment must be made in full and upfront. If you decide to cancel the policy, the insurance company will not be able to provide a refund. Under State guidelines, insurance companies provide a free 30-day tail upon cancellation. If you are seeking a Stand-Alone Tail, we recommend you purchase this coverage within 30 days of your policy cancellation. Otherwise, there would be a gap in coverage and insurance companies are likely to decline to offer coverage. Do you have claims made coverage now and joining a new practice or facility? If so, they may opt to purchase your “prior acts” coverage, also known as “nose” coverage. This coverage would be included in your new malpractice insurance coverage. With it, the company will respond to claims for services rendered from your retroactive date. Remember to notify your current company of any incidents that may give rise to a claim. There are plenty of options available now for tail coverage. You don’t have to decide on your own. Simply give us a call or send us an email. We’re happy to help.